Hi all. I'm Jin, and I'll be working on the designs for the Stack Exchange sites as they graduate from the beta phase. Each site will have its own unique theme that will reflect its topic. However, all sites will share quite a bit of common elements so they feel like they're part of the Stack Exchange family. First, early congrats on the upcoming launch! Also, I'd like to thank you for being so patient. For the DIY/Home Improvement design, I used some familiar elements from real life. The design goal is to give that home improvement feel, but at the same time keep the site design clean. I tried not to make the design overly skeuomorphic. I believe what I came up with has a good balance. click on the image to see the full resolution version. 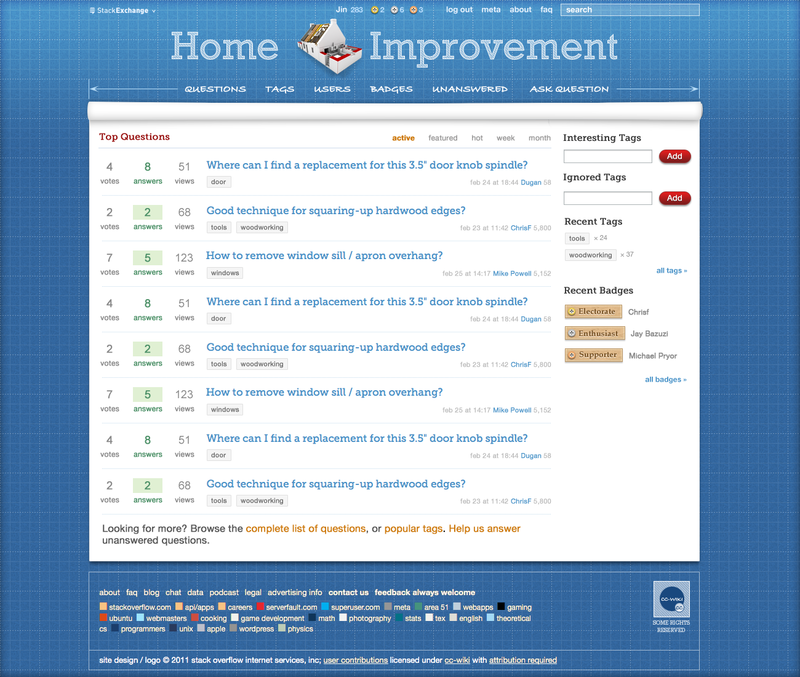 I love the background (graph paper) and also the Home Improvement header image. I love the badges background looking like boards. I did not at first understand those were screws in the boards for gold, silver, bronze (but now I see it and like it). The "Questions", "Tags", "Users" links at the top look too small... they don't stand out for me. I like what you did with the size arrows on either side of the "Questions", "Tags", "Users" links. Above "Top Questions" header and below "Questions", "Tags", "Users" links is a white image (the top of a door frame??). I don't know what that is and it looks too big to me (making the header and the content below look too distinct). I like the design, but one thing is bothering me: the 404 page. What is with this duct tape? Our site is called "Home Improvement" and we don't have a single reference?